You’re trapped in a cave that’s trying to drive you mad. It’s full of things that have tentacles, and all of them want to corrupt your soul. It’s the idea of corruption that makes Sundered, a side-scrolling 2D action game that feels like a meeting of Super Metroid and Dark Souls, stand apart games like it. Sundered is about trying to escape from a cavernous Lovecraftian world, where your enemies are cultists and creatures whose bodies have been warped into seething masses of teeth and flesh, and the very rock beneath your feet occasionally roils as strange tentacles stretch out toward you. 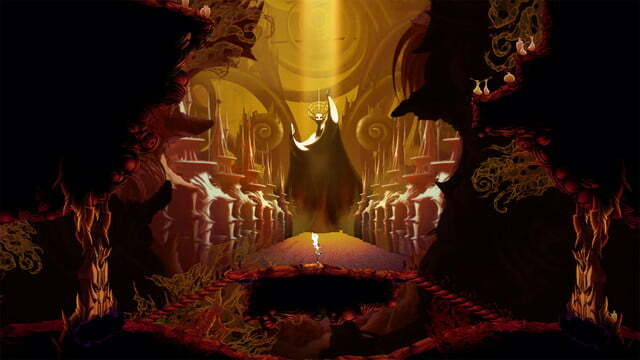 Sundered carries a dark, horror-informed atmosphere that makes exploring its shifting corridors intriguing but oppressive. Tone is everything in Sundered. The game carries a dark, horror-informed atmosphere that makes exploring its shifting corridors intriguing but oppressive. Its gorgeous hand-drawn graphics give everything a creepy life, and its ambient music rises to warn you when you’re about to be overwhelmed by a flood of monsters. In a preview build provided by developer Thunder Lotus Games, those elements coalesce to make Sundered feel a little different from other games like it. Sundered taps into the essential nature of this sort of title — often referred to as “Metroidvania,” after its two most famous examples, Nintendo’s Metroid series and the 1997 PlayStation game Castlevania: Symphony of the Night — while also twisting it just enough to make playing feel fresh. Or maybe the better way to describe what Sundered does to the Metroidvania formula is that it corrupts it, forcing players to always be on their toes as they delve into the depths. Especially since explosion of popularity surrounding the Dark Souls series, video games have found new ways to embrace death and difficulty. In Sundered, death is a natural part of how you play the game — in fact, you have to die in order to make any progress at all. In the pre-alpha preview build, players start in a central hub location, before venturing out into the unknown. Enemies aren’t just waiting out in the world as they are in games like Super Metroid or Castlevania, but instead spawn in dynamically, rushing at the player from offscreen in waves. You’ll cut them apart with a spectral sword, dodging their attacks with a short-range roll. A bar that measures stamina limits how many dodges you can make in short succession, just like in Dark Souls, although it doesn’t cut back on how much times you can slice up baddies. When you’ve got a little range, you can fire a giant energy cannon, the recoil of which will send you flying. Cutting down enemies supplies you with “shards,” which can be spent upgrading your character. The only place to upgrade is back at the central hub room, and you can return there on foot. Instead, you have to be killed. So Sundered makes each foray out into its dangerous world an expedition to see what you can find, and to discover what you can and cannot handle. There are mini-bosses and major battles scattered along the way, but even wandering around in normal territory, you’ll occasionally find yourself facing an onslaught of creatures as the soundtrack hits a musical cue that sounds like the striking of church bells, almost as if to notify you of your demise. Especially early in your treks, that sound usually will mean your impending doom. Every trip out feels like it’s on borrowed time; the hope is to finally make it through that one challenge or to find that one upgrade before you’re inevitably overtaken. Sundered makes each foray out into its dangerous world an expedition to see what you can find, and to discover what you can and cannot handle. All isn’t lost, however. Dying returns you to the central hub room, where you can spend the shards you’ve taken from destroyed enemies to upgrade your character, increasing how much damage you do, how much damage you can absorb, how often you can dodge, and the like. Each venture out, then, makes you more powerful, and allows you to make it further the next time. Don’t think that you’ll be comfortable after a few deaths and a few stat boosts, though. 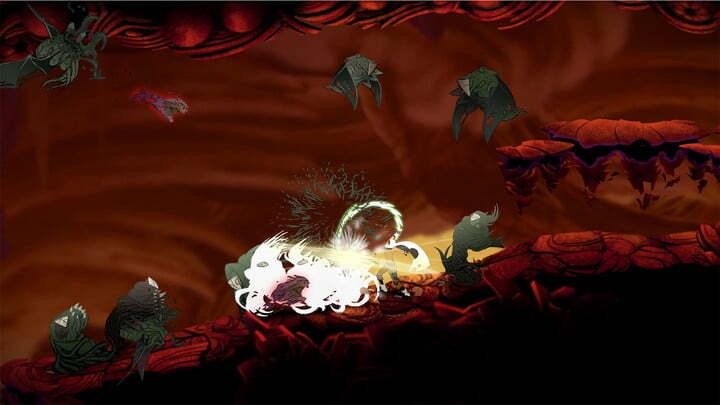 First, Sundered shifts the layout of the level each time you die. Key rooms stay in the same places, but the paths connecting them always change, which keeps you from learning the terrain and fighting monsters in the same advantageous locations over and over. And those waves of enemies Sundered throws at you are generated procedurally by the game, so they change and vary based on factors like your location, how long you’ve gone since an attack, and how strong you’re feeling. It’s a lot like Valve’s “Director” system in Left 4 Dead that tunes the experience to keep you on your toes. Sundered keeps track of how well you’re doing and tries to stay unpredictable to keep you challenged even as you level up, so the farther away from home you get, the more dangerous things become. The one constant is that you’ll die, and die again, as you do in titles like Dark Souls and Rogue Legacy. And like those games, death is used as a way to get better and learn more. The number one mainstay of the Metroidvania formula is the gathering of new abilities that players need to make their way to previously inaccessible paths, or to bring down previously unbeatable enemies. Sundered’s preview build included two such abilities: A fast dash for dodging attacks and moving through waterfalls that block off certain areas, and a quick, powerful sword strike that smashes certain barriers. The focus of the preview build is in becoming strong enough to make it to those abilities, which eventually open the way to a fight with a colossal boss. The big change Sundered brings is giving players “corrupted” abilities. Wreck some mini-boss monsters and you’ll earn crystals that can alter your new powers, making them quite a bit more powerful. In the case of the Power Dash ability, corruption turns it into a short-range teleport that worked in any direction, instead of just forward and back. The sword strike ability becomes a charge attack that turns your whole body into a weapon. The big element that will likely go a long way to tying Sundered together even better is its story, which wasn’t part of this preview build. The preview build for Sundered showed off most of what the game will be like, but didn’t include any of its story or lore components. 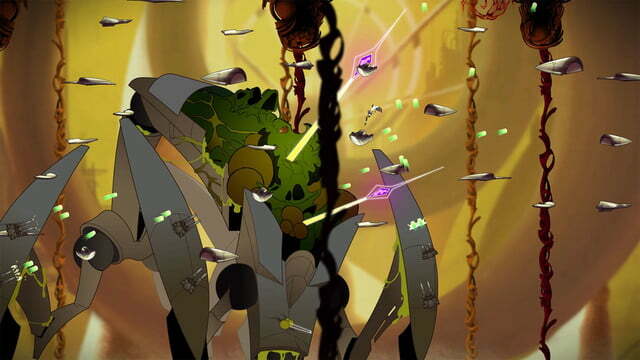 Thunder Lotus Games has said the choice between normal abilities and corrupted abilities will be a big part of Sundered’s story, though (the tagline for the game is “Resist or Embrace,” apparently in reference to the aforementioned corruption), and according to the game’s description on Steam and Kickstarter, choosing the more powerful corrupt abilities will cost you your humanity — whatever that might mean. Whether you go for the more powerful corrupt abilities or not also determines which of the game’s multiple endings you unlock. Hopefully it’ll be a tough choice, because opting for the corruption makes you quite a bit more powerful. The preview build culminated in a fight against a massive enemy like something out of Doom — a giant, decaying green corpse sporting robotic spider legs bristling with laser cannons. Mastering both the two new abilities is key to victory, and having the corrupt versions makes things a lot easier. But without them, it’s certainly not impossible. 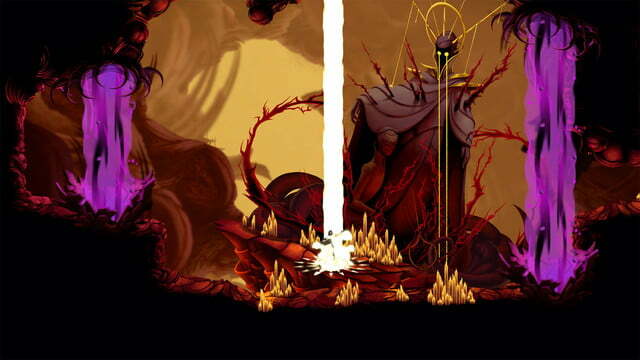 Players will recognize a lot of the old-school influence on Sundered’s massive boss battles. There are patterns to learn, and after a few deaths, you’ll have all the information (and upgrades) you need to crush your adversary. At first blush, Sundered feels like a fairly standard Metroidvania title, but it’s a game that’s goes further as a whole than when taken as a list of features. Its oppressive atmosphere and art style, its marriage of exploration and death, and its ideas about the cost of the constant quest for more power offer a different take on some of the core ideas of games like Super Metroid. And its dynamic enemy encounters mean you never know when your next fight for your life is coming, which adds a bit of a fight-or-flight urgency to your explorations. Is it better to sprint for the room with an equippable perk that’s just out of reach and risk dying on the way, or stand your ground and fight overwhelming odds? 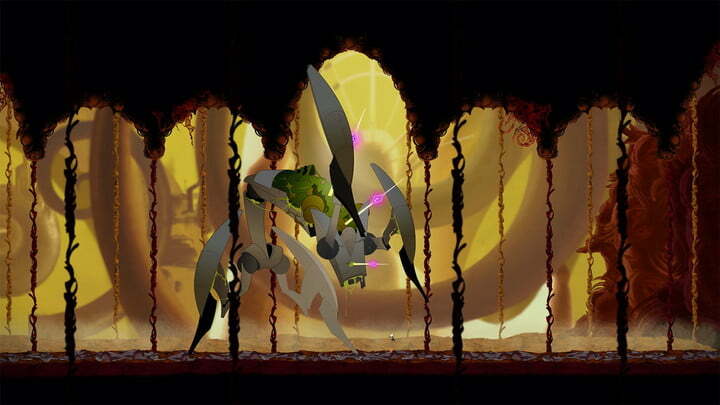 From a gameplay standpoint, Sundered offers a lot of fast-paced action, rewarding quick thinking and quicker reactions. Its pacing makes each foray a little more rewarding than the last. But the big element that will likely go a long way to tying Sundered together even better is its story, which wasn’t part of this preview build. It sounds like the coolest thing that Sundered will have to offer is the question of corruption, and how it’ll affect the game for players as they opt for either standard or corrupted abilities. Amping up your powers changes how Sundered plays quite a bit, and they’re sure to have drawbacks. In order for it to work, Sundered will have to challenge players not to choose the most powerful option in a game, and a genre, that is always about increasing your power in order to advance, in the most literal way possible. That’s a fascinating conflict that adds a fresh take to the Metroidvania genre, and Sundered has the gameplay chops to pull it off. We’ll have to wait to see if the rest of the game can match it. Look for Sundered to release in July on PC and PlayStation 4.